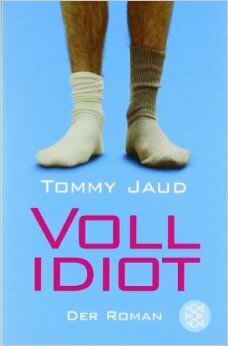 Much as I enjoyed another Tommy Jaud book (Resturlaub: Das Zweitbuch), I found Vollidiot somewhat unrounded and altogether disappointing after finishing it. The story revolves around Simon Peters, a late-20s youngster in Cologne, who is fed up with his job, his friends, his being single–his life in general–and how he goes about trying to set things to rights. Essentially, of course, everything he tries to achieve goes wrong, and every action he takes has a punchline waiting around the corner. There isn’t much by way of a story here – most of the action is punctuated by nights in the pub, and the best intentions trying to get a date, but Jaud has an eye for making even the most mundane humourous. Our antihero Simon’s cleaner, a Croatian by the name of Lala, adds a lot to the mix with her antics, setting him up on a blind date, accompanying him to a gig whilst he is on another date, as well as breaking things around the flat and apologising in her heavily accented German. Jaud could probably have enough material for another book just based on her day-to-day life. Nevertheless, there simply isn’t enough here to tie the book together. Little happens of any consequence, and the humour factor ranges from sometimes inciteful, biting sarcasm, to simple cringe-inducing moments of mania on the part of the main character(s). It starts off strong, with some great descriptions of Ikea’s policy towards single people, or the gym Simon joins to get fit (which turns out to be a haven for homosexuals), but towards the end of the book I found there were fewer and fewer laughs to be had, and the ending is rather abrupt and feels somewhat rushed. Still, like the previous reviewer, I can certainly recommend reading something like this to people interested in learning German. This is by no means a prize-winning piece of literature, but the language is very contemporary, and should be relatively easy to follow for learners. It would probably appeal to most men in the same age-range (particularly anyone who’s experienced that feeling of being fed up with everything), and no doubt to the many women who find themselves in a relationship with one of these Vollidioten!